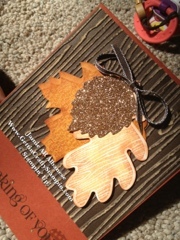 Getting Crafty with Jamie: Fall Spectacular Sneak Peak! I know, class tonight is going to be full of Sparkle, Warm Colors, Texture, I am soooo excited!! Here is a sneak peak of one of the Four Cards for tonight! It's not too late to RSVP!! See how to get it for FREE! With our Holiday Idea's book you are getting some amazing Champagne Glimmer Paper, Early Espresso Core'dinations card stock, Wonderfall Stamp set and coordinating Bigz Autumn Accents Big Shot die. I love our new Gold Pen, look how it adds to the sentiment! 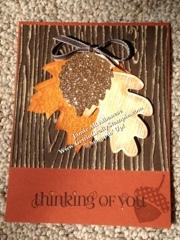 I hope you feel the Fall Spectacular with this card. Tell me what you think, comments are appreciated! Tell a Friend, please! !